Tony Borroz opens up what has been dubbed “The 2018 Indy 500 Notebook” for an unedited look at The Greatest Spectacle In Racing. This new series will span the days leading up to and after the 102nd Indianapolis 500. 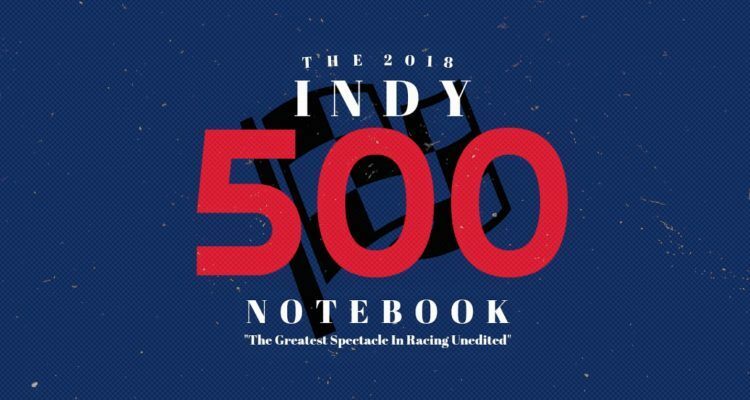 The 2018 Indy 500 Notebook is an unfiltered look and what makes the Indy 500 so alluring in the first place. Part 2: “Hey Hinchcliffe, Wanna Race? Then Go Faster!” here. Part 3: “Carb Day” here. Part 4: “By This Time Tomorrow” here. Part 5: “On The Fly – Before The Green Flag” here. 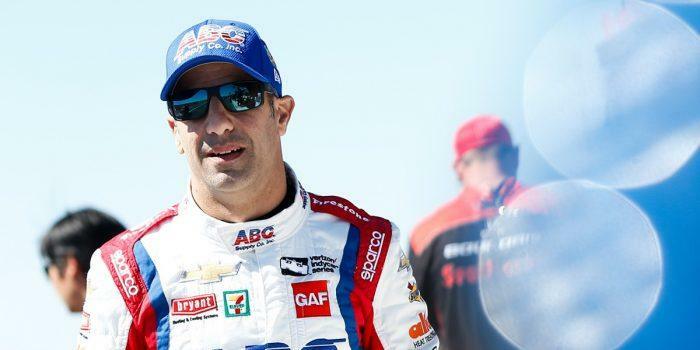 Before the drivers get to their cars and fire up their engines, Tony Kanaan echoes my initial observation: the high ambient and track temperatures, plus a new car, means things are going to be slippery out there. The vast bulk of people participating in The Indy 500 these days are seasoned professionals. They are not going to just wing it, dive into the deep end and “see how things” go. There is too much on the line, financially, professionally, and personally for any of these people to just give it a try and trust it to luck. As they line up to take the green after the pace laps, things look very scruffy. The cars are not all three-by-three-by-three. Only a couple of rows are lined up right and the start is pretty ragged. That said, it is a completely clean start. There are no accidents. No one spins. Nobody does anything stupid. In a lot of ways, the start of the 102nd running of The Indy 500 was rather uneventful except for the fact that Kanaan is up to 7th in one lap, making up three positions while everyone else is cautiously biding their time. And so the first quarter of the race unfolds in a rather processional way. Everyone is feeling out the track, their tires, the amounts of grip (aero and mechanical), and the amount of turbulence and buffeting generated by the cars in front. At first, for ten laps or so, I was surprised. But it started to make sense. I can almost hear the voice of Roger Penske in my head: “Don’t do anything stupid.” Even on a good day, the difference between doing it Right and doing it Wrong when lapping at the Indianapolis Motor Speedway is very slight, a matter of inches. Today, everything is stacked against the drivers. Every little bit added into the equation – the heat, the new aero, all of it – is a strike against the drivers. So everyone is out there, going as fast as they can without stepping over the limit. Biding their time. Being patient, like a hunter, waiting for the game, or in this case, the race, to come to you. Ryan Hunter-Reay leaves his pit stall during the 102nd Indianapolis 500. Photo: Karl Zemlin. Then on lap 47 James Davison slows and collects Takuma Sato, last year’s champion. A collective groan goes up from the stands. People genuinely like Taku, and seeing him get taken out early does not go over well. Davison, a well liked Australian, was having trouble for some laps, struggling to get up to, and sustain, a decent speed. It seems he was slowing down to pick his way through traffic and come back into the pits yet again when Sato ran over him. Afterwards, Sato took it all with a shrug that silently voiced the eternal sentiment “that’s racing” and Davison seemed honestly upset that his mechanical troubles took out another competitor. On lap 59 Ed Jones crashes out of the 24th spot. The rear of the Ganassi driver’s car stepped out real quick. Initially it seemed as if something broke, but, as following events would show, Jones’ crash was the emblematic first of many, setting the pattern. On lap 68 Danica is out. She spins to the outside of Turn 4, spirals down into the infield before pit in, gets out of the car under own power, and with that, the racing career of Danica Sue Patrick is over. The notes I jotted down read: “Danica out, Danica out” and “spin is very similar to Ed Jones.” The various replays show she just lost it. 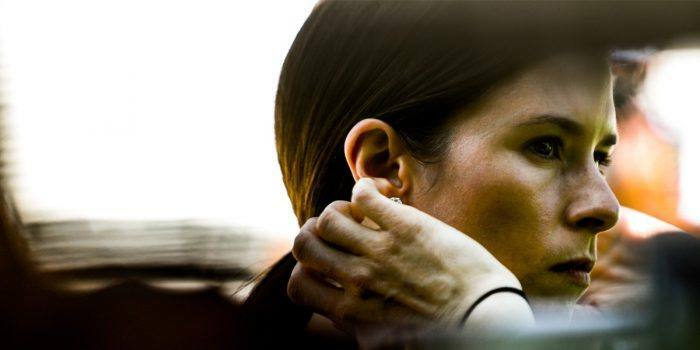 Danica Patrick. Photo: IMS LLC. Then the Jones/Patrick syndrome continues when, on lap 140, Sébastien Bourdais loses it. At first I thought he had gotten caught up in someone’s dirty air, Dixon maybe, got a little bit lose, caught it, but caught it too hard, corrected, over-corrected, over-corrected that and then lost it entirely. In the airplane game, this is known as PIO, Pilot Induced Oscillations, and is usually impossible to get yourself out of. On lap 146 we can add Helio to the Jones/Patrick/Bourdais list. While running fifth and going like a scalded cat, the extremely likable Brazilian spins on his own coming through Four. 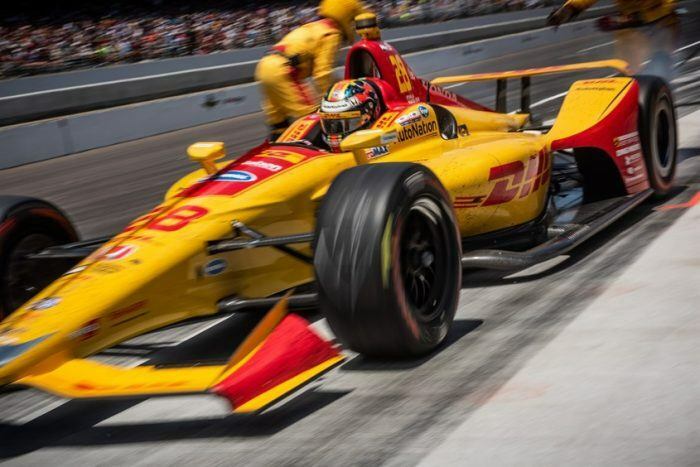 “The rear just gave up,” he said with a shrug, and that was that for Helio trying to win his fourth Indy 500 . . . and now it’s becoming apparent that getting win #4 is somewhat of an obsession for him. It will be interesting to see how this plays out in the years ahead. Eight laps later, completing lap 154, Sage Karam gets high in Turn Four, gets into the gray (i.e. out of the rubbered-in groove), gets into the marbles (i.e. where all the debris and rolled up rubber gets shuffled to the outside of a corner), finds the wall hard enough to collapse the right side suspension front and rear, and grinds along the outside wall to a stop. So far, this is the only single car accident that deviates from the Jones/Patrick/Bourdais/Helio norm. 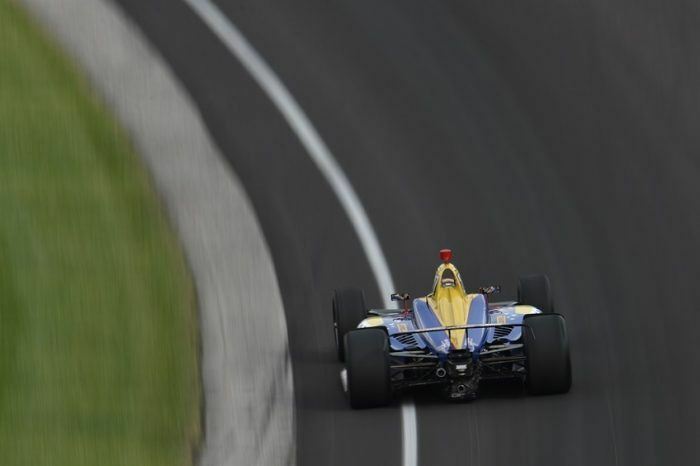 Alexander Rossi negotiates Turn 1 during practice for the 102nd Indianapolis 500. Photo: Chris Owens. And now, finally, with less than 50 laps left to run, everyone is getting racier and racier, Alexander Rossi first among them. The quiet Italian-American has been driving a great race, steadily moving up through the field after a catastrophic qualifying session. Rossi is hooked up, to use the phrase, to the point of having tons of grip and he can drive the car anywhere he cares to on the track; high, low, late dives, it’s all the same to Rossi. At one point Rossi passes a car deep on the outside of a corner, then takes it three-wide and simultaneously passes two cars on the outside. It’s the bravest two moves of the race, and suddenly, in terms of sheer pace, Rossi looks like he is going to show everyone who the fastest is. As if via telepathy, every other driver in the field and their pit crews kick into high gear. Okay, now we’re going to go racing. The speeds tick up, the times start to drop, corner after corner, lap after lap, and the passing maneuvers get closer and closer and closer. A fine red mist descends. Speed is all that matters now, victory its definitive byproduct. On lap 188 the last of the solo crashes occurs when Tony Kanaan, a racer noted for his commitment and bravery, spins and crashes out. The affable Brazilian wiggles coming out of Turn 2, catches it, loses it, and that was that, Indy 500 over for this year. Tony Kanaan. Photo: IMS LLC. Now the checkered flag is so close everyone can almost taste it. Oriol Servià stays out while leading, trying to stretch his fuel to the end and win the whole thing on a roll of the dice. In terms of speed, it seems to be a three car battle between Will Power, driving for Penske, Ed Carpenter, driving for himself, and Chip Ganassi’s Scott Dixon (how did he get up here? Oh right, he’s Scott Dixon) and Rossi. With a handful of laps to go, Servià and Charlie Kimball peel off for the pits, their fuel gamble not paying off and the hot shoes stand on it like there’s no tomorrow. Nobody, however, stands on it as hard as Will Power and the introverted former series champion drives to his first ever Indy 500 win. Suddenly, this all seems quite fitting. He was fast all month long, won the GP race on the road course, and now has capped it all off with a 500 win. It is, in retrospect, easy to call this a flawlessly executed race from the Penske driver; he stayed out of trouble, bided his time and when he had to, he just flat out left everyone in his dust. As his car pulls into Victory Circle, the joy and surprise from Power in the cockpit is palpable through the TV screen. Power seems to be on the edge of losing control, venting every emotion he seems capable of carrying, screaming and roaring, fists clenched and waving, manically looking left then right then left again. Finally his wife, Elizabeth Cannon, appears out of nowhere, and Power’s ego and super-ego finally tamp down his id. A little. Power embraces his wife Liz after winning the 102nd Indianapolis 500. Photo: IMS LLC. He snatches the traditional bottle of milk away from the person holding it, looks skyward, opens his mouth and pours the entire bottle’s contents out. Only a small amount makes it into his gaping mouth, and as the rest of the ice cold milk hits his face, Power instinctively reacts by shaking his head back and forth violently, showering the remainder of the milk all over the face of the pageant winning Indy Queen. Simon Pagenaud shows up out of nowhere and hugs Power. Pagenaud, about as competitive as the come, is genuinely happy for Power, and another puzzle piece falls into place for me. Power now, by visible steps, starts to calm down in Victory Circle. A pit reporter shoves a mic in front of him. Will talks about his doubts of ever winning the 500, about how, after a literal decade of trying, he has finally won it. And that’s the last piece. That’s what has been missing from Will Powers’ internal resume. All of this, the screaming, yelling, venting, going berserk with the milk, these are all symptoms of relief as much as joy. For all of Will Powers’ accomplishments – multiple race winner, rookie of the year, series champion – he is still riddled with self doubt. That is a very, very rare state of mind for a race driver. If anything, these knuckleheads usually display far too much self confidence. Will Power has felt that lacking an Indy 500 win was a serious black mark on his career. He felt, in so many words, that if he never won at Indy, he wouldn’t measure up. I know, it makes no sense to me either. Ever since he showed up in 2005 he was Fast with a capitol “F.” Will Power not measure up? Are you nuts? He’s fast, cool under fire, and has a rather typical amount of hyper-competitiveness for a racer. Not measure up? That’s just stupid. 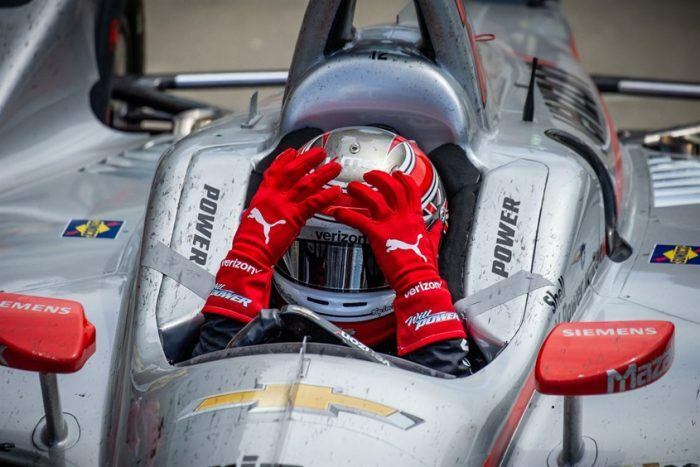 Will Power in disbelief after winning the 102nd Indianapolis 500. Photo: Karl Zemlin. The final shot that matters is a replay of The Captain, Roger Penske, watching his driver cross the line and take the checker to notch up victory number 17 for Team Penske. When they go to the shot of Roger, standing on the pit wall, arms raised halfway, Power was about 150 yards from the finish line. He had enough of a lead and enough momentum that even if all four wheels fell off, he still would have won. But there stands Roger, the winningest guy in Indy 500 history, waiting . . . waiting . . . starts to raise his arms, nope . . . wait a little more . . . start to wave? nope, not there yet . . . waiting . . . and . . . and HE’S ACROSS THE LINE!!! Now Roger Penske starts waving and smiling and jumping around, full of joy and elation and a job done better than anyone else for the 17th time. In an odd way, everyone else seemed just as happy. It was if the unspoken summary was, “Oh, Will Power finally won? Well good for him! It’s about time.” Maybe Will can finally internalize this last piece that has been missing for him. Maybe now he can, in some deeper way, relax. Relax and realize that he has nothing to prove, to anyone, least of all himself. Part 7: “A Modest Proposal: The EV 500” here. Tony Borroz has spent his entire life racing antique and sports cars. He is the author of Bricks & Bones: The Endearing Legacy and Nitty-Gritty Phenomenon of The Indy 500, available in paperback or Kindle format. His forthcoming new book The Future In Front of Me, The Past Behind Me will be available soon. Follow his work on Twitter: @TonyBorroz. No Comments on "2018 Indy 500 Notebook: Part 6: On The Fly – Everything That Matters"